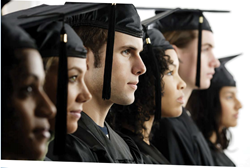 NASFAA and its members can offer advice and resources for Class of 2016 graduates. At a time when more than half of college seniors graduate with student loan debt each year, it’s important to be prepared for what’s to come—and the National Association of Student Financial Aid Administrators (NASFAA) and its members are here to help. As class of 2016 graduates from across the country walk across the stage to accept their diplomas this month, the idea of starting to repay their student loans may be daunting. At a time when more than half of college seniors graduate with student loan debt each year, it’s important to be prepared for what’s to come—and the National Association of Student Financial Aid Administrators (NASFAA) and its members are here to help. The number of students who graduate with debt has consistently inched up over the last 10 years, from 65 percent in 2004 to 69 percent in 2014, according to research from the Institute for College Access and Success (TICAS). Among seniors who graduated in the Class of 2014, the average amount of debt was $26,900, according to the College Board. Although Federal Subsidized and Unsubsidized Direct Loans have a six-month grace period before repayment begins, new graduates should use that time to fully understand the repayment options available, select which repayment plan is the best fit, and begin making a budget that factors in monthly student loan payments. Luckily, there are plenty of resources available through financial aid offices, the federal government, and NASFAA to help new graduates get off to a good start in repayment. Alumni should know they can still seek advice from their institutions’ financial aid administrators. These financial aid professionals can offer advice on how to review and select repayment plans, where to find the total amount owed, how to avoid default, and what can be done if students are having trouble making payments. New graduates can also refer to NASFAA’s resources on student loan repayment, including tips for struggling borrowers. NASFAA’s experts are on hand to discuss how new college graduates can set themselves up for success in student loan repayment, and what resources they can turn to for more help. To speak to a NASFAA expert, please email us at news(at)nasfaa(dot)org or call 202-785-6959.